Composed by Manuel de Falla (1876-1946), Isaac Albeniz (1860-1909), Enrique Granados (1867-1916), Joaquin Turina (1882-1949), and Padre Antonio Soler (1729-1783). Masterworks; Piano Collection. Dover Edition, Piano Collection. Romantic Period and Spanish. Book. 176 pages. Dover Publications #06-296172. Published by Dover Publications (AP.6-296172). ISBN 0486296172. 9x12 inches. English. 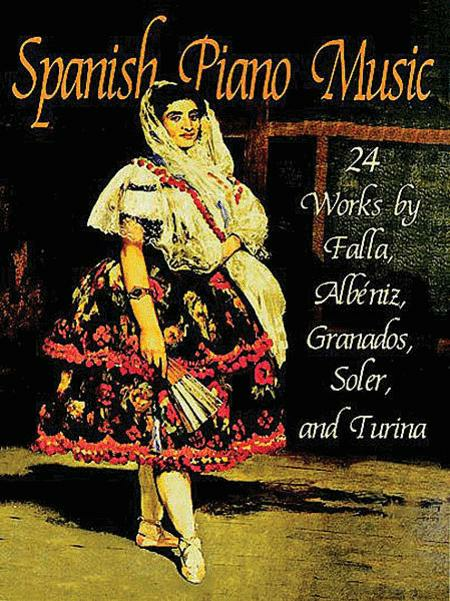 Superb selection from the golden age of Spanish piano music: ""Seguidilla" and "Leyenda (Asturias)" by Albeniz; "Ritual Fire Dance" from de Falla's El Amor Brujo; "El Amor y la Muerte" from Goyescas by Granados; Turina's Danzas Andaluzas, Op. 8 (3 pieces) and more. Reproduced from authoritative editions. Intermediate to advanced level.